The belief that subcultures or underground cultures are “dead” is stubbornly persistent. There is no shortage of evidence against such claims, but Lugubrious Audio, a label that puts so much love and care into releasing music physically (check out the amazing album art package with this latest release) and digitally, is a particularly vivid example of a thriving DIY project. 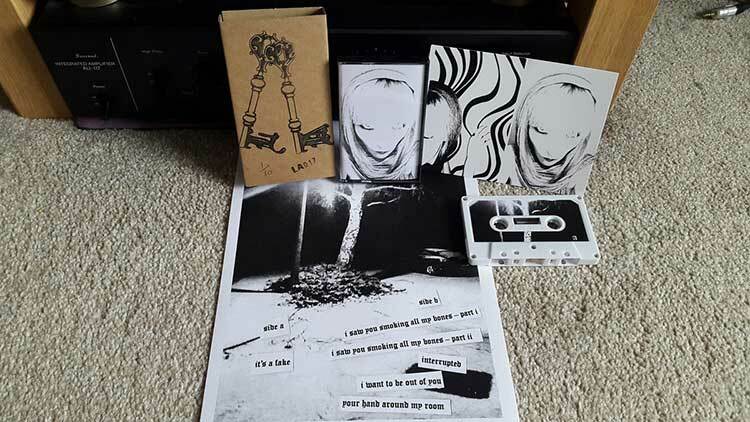 Based in Durham, England, LA has now released 19 cassette packages and their roster is international and multi-genre. Additionally, their elaborately presented releases come at very affordable prices indicating that financial profit is not a consideration. Cielo Volume 2 follows the 2016 self-titled release (also on limited edition cassette) and for the uninitiated, a great introduction to the artist is the video for “All Die on my Street.” This track and video are uncompromising, unsettling and acutely aware of the power of images; though there are other more abstract and elusive elements to Cielo. Some obvious reference points might be Slint’s Spiderland or even the more abstract iterations of Sonic Youth but Cielo’s spectral bilingual audioscape is all its own. Many of the tracks here are curiously short. They evidently have enough compositional complexity to be much longer songs, but the artist has simply chosen to present them as short, evocative fragments. Consequently, one walks away from this album with single lines lingering and resonating in the imagination. Highly recommended. This entry was posted on 6 June, 2018 in homepage and tagged Arin Keeble, Lugubrious Audio. Bookmark the permalink.